In late 2013, Beijing sent an infantry detachment to serve in the United Nations peacekeeping mission in Mali. This is the first overseas deployment of Chinese combat troops in a peacekeeping role. The deployment didn’t receive much initial attention, but it’s another sign of a slowly but increasingly assertive Chinese role in conflicts around the world. In all fairness, this can be a good thing. Chinese troops are able to reinforce under-equipped and poorly-manned peacekeeping missions. If Beijing wants to be seen as less aggressive, then teaming up with the U.N. is a good way to do it. “China’s combat troops will abide by the U.N.’s peacekeeping regulations. Soldiers are allowed to open fire only for self-defense purposes, and never take positions to help either party during a civil war,” retired Maj. Gen. Xu Guangyu reassured the South China Morning Post. But there’s also a price to bringing in the People’s Liberation Army. For one, Chinese influence in Africa means greater access to natural resources. That helps fuel a growing Chinese economy. However, that can also mean blurring the line between solving conflicts and making them worse. China contributes around 2,200 peacekeepers to missions all over the world. To put that into perspective, that’s more than all the other four permanent security council members combined. 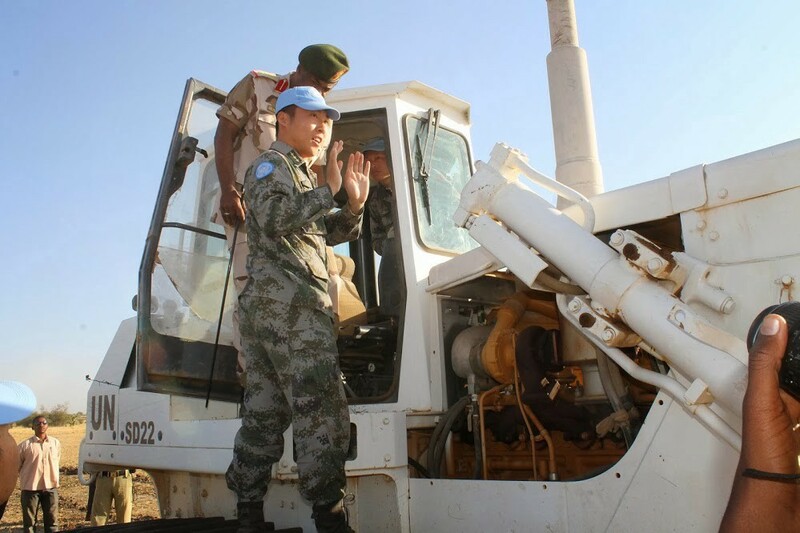 The Chinese peacekeepers are working not only in Mali—but Western Sahara, the Democratic Republic of the Congo, Sudan, Liberia, Ivory Coast, Cyprus and Lebanon. In general, these missions have traditionally focused on support functions, with most of the personnel being doctors or engineers, rather than combat troops. But that’s not to say that they haven’t been exposed to danger. During the 2006 war in Lebanon, an Israeli airstrike killed Chinese Maj. Du Zhaoyu, who was serving as a U.N. military observer. Chinese engineers in Lebanon have also engaged in dangerous de-mining operations, clearing out landmines and other unexploded ordinance throughout Lebanon’s demarcated Blue Line. In the past, small detachments of Chinese infantry have deployed to protect their contingents of doctors and peacekeepers. But in Mali, Chinese troops are actively patrolling and conducting security operations in the remote, northeastern city of Gao. Though Gao was relatively secure when the Chinese arrived—French forces recaptured the city from Islamist rebels in January 2013—the deployment is not without its risks. At least 14 Chinese soldiers have been killed in peacekeeping operations globally. And lately, the situation in Mali has taken a turn for the worse. There exists the possibility that Chinese troops could get drawn into a skirmish during their stint in Mali. But at the end of the day, that’s what infantry are for. Sending Chinese troops overseas in peacekeeping missions is also—in many ways—a sensible choice for Beijing. It allows China to be seen as an active and assertive player on the global stage. And the blue helmets give Chinese operations legitimacy and the backing of the international community. It also gives Chinese troops the opportunity to gain operational experience in different environments, and to familiarize themselves with the armed forces of other nations. It gets soldiers out of their garrisons and into the world—to see and to be seen. China also sends police on U.N. assignments. 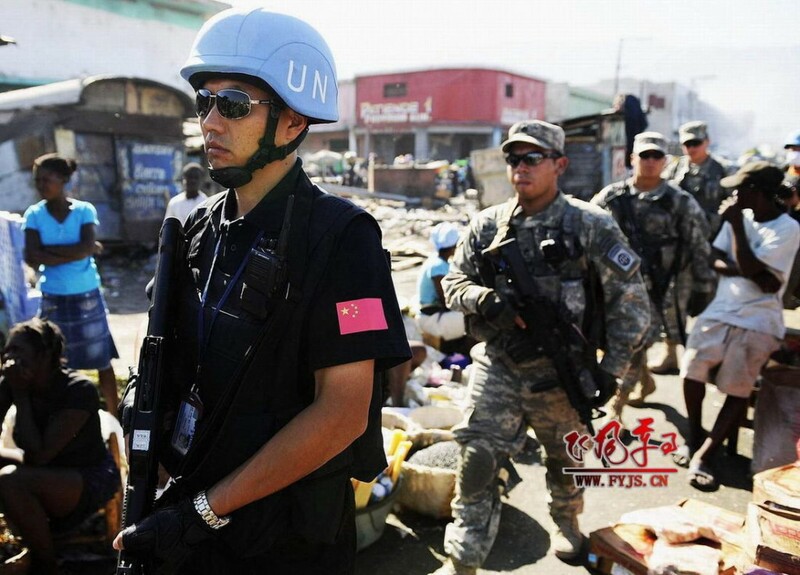 In the aftermath of the earthquake in Haiti in 2010, Chinese SWAT officers teamed up with American paratroopers to reinforce the U.N. mission for presence patrols. Though a minor operation, it was a huge moment. Even though China and the U.S. conducted joint emergency relief drills before, rarely had uniformed American and Chinese personnel worked together in actual crisis conditions. However, Chinese troops have found it difficult to work with other nations. For example, the PLA force in Mali is short on English speakers and almost completely without French speakers. As a result, they have little direct interaction with the local populace. They interact little with fellow peacekeepers from other nations. And despite holding elaborate and theatrical ceremonies, the Chinese military doesn’t interact much with the international press. Traditionally, the U.N. has preferred its peacekeepers to come from countries with as little stake in the conflict as possible—to ensure impartiality. China, for its part, insists it doesn’t take sides. But lately, Chinese peacekeepers have deployed to countries in which Beijing has significant political and economic interests. Further, the deployment comes only after something has been done for China. For instance, Chinese peacekeepers deployed to Liberia only after Liberia agreed to cut off diplomatic ties with Taiwan. The majority of Chinese deployments have also been to Africa, where Chinese companies are increasingly investing in infrastructure and natural resources. The most controversial of these deployments is the continued presence of Chinese forces in Sudan. These troops are a contingent of the joint U.N. and African Union peacekeeping mission in Darfur, known as UNAMID. But China is a close ally of Sudan, with strong trade and military ties. The Sudanese military depends on imports of Chinese arms and munitions. Chinese companies have invested heavily in Sudan’s oil industry, including wells and refineries in Darfur. But among the international community, there was initially guarded optimism the Chinese deployment could fundamentally change the conflict. Reinforcements—any reinforcements—had arrived. There was also hope China would use its political and economic leverage to pressure the Sudanese government to curb its support for the Janjaweed militias. In fairness, Chinese engineers did a phenomenal job reinforcing the mission in Sudan. They built bases and fortifications for the under-resourced A.U. force. They were also able to quickly and cheaply update existing facilities. They were also far more effective than Lockheed Martin, who received a no-bid contract with the U.N to do exactly that. But despite the improvements to UNAMID’s bases and accommodations, the Chinese troops hardly solved the conflict. The U.N. mission was still undermanned and under-equipped. It was also still frequently subjected to violence and harassment by the Sudanese government—a government China supports. Worse, the presence of Chinese troops did not reign in the Sudanese-backed militias, or even the Sudanese government itself. In an embarrassing development, the U.N. detected the widespread use of Chinese weaponry in Darfur—including weapons used in attacks that killed UNAMID peacekeepers. Chinese engineers and Sudanese troops also regularly teamed up to bolster government infrastructure like roads and airports. That mission continues, along with others. For China’s troops, that means critical experience building roads, bridges and bases in tough environments. They’ve cleared minefields for safe passage. As they branch into security and combat roles, they’ll be tested further. But that also means they’ll learn. China’s continued expansion of its peacekeeping operations shows an increasingly engaged world power. This also means those troops will be put under a bigger spotlight. And if China wants to bolster its operations further, it will likely have to work more directly with fellow peacekeepers—and be more transparent in the process.